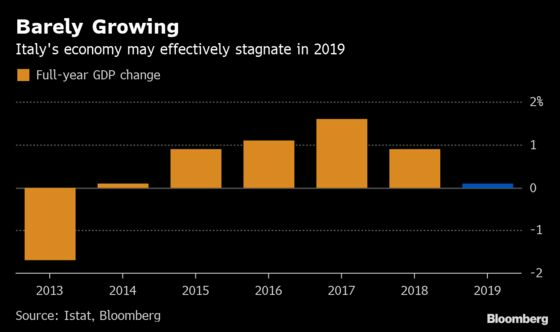 (Bloomberg) -- The Italian Treasury is set to slash its growth forecast for this year and raise its projected budget deficit, according to two senior officials with knowledge of the draft outlook. The economy will expand by just 0.1 percent this year, according to the draft, which is due for cabinet approval by April 10, the officials said. The government’s previous forecast was for a 1 percent expansion and the new prediction is in line with Bloomberg’s latest survey of economists. Such dire figures highlight the uphill struggle the government faces to fix the economy. The country, which fell into a recession late last year, is burdened with a debt ratio of more than 130 percent of GDP and stagnation will make it even harder to take control of the fiscal situation. The budget shortfall is projected to be 2.3 percent or 2.4 percent of GDP, compared with the previous forecast of 2.04 percent agreed on with the European Commission last year. The government is aiming to achieve growth of 0.3 percent or 0.4 percent with a series of measures to boost output included in the so-called Growth Decree, which goes to a separate cabinet meeting Thursday. The forecasts could still be revised before they are approved by the cabinet next week, the officials said, asking not to be named discussing confidential analysis. That followed admonitions about its prospects in the past week from both Commission President Jean-Claude Juncker and the Organisation for Economic Cooperation and Development. Juncker said on a visit to Rome he wants “extra efforts to maintain growth” after meeting Prime Minister Giuseppe Conte on Tuesday. The previous day, the OECD said there’s increasing urgency for measures to reduce public debt. Italy’s dismal economy is fueling tensions between the coalition allies -- the rightist League and the anti-establishment Five Star Movement -- as they have limited room to deliver reforms ahead of May’s European Parliament elections. Tria, who himself has been targeted especially by Five Star for resisting reform efforts, said Monday the government is committed to meeting its structural deficit target, adding that the government will press ahead with planned asset sales to cut debt.